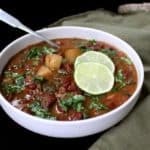 An Instant Pot Kidney Beans Curry with Spinach and Potatoes that requires just 10 minutes of prep, and is ready in under an hour. There is no added fat in this curry, but it's delicious and nutritious and packed with flavor and veggies. A soy-free, gluten-free, vegan recipe. Soak the kidney beans for two hours in enough hot water to cover by at least two inches. Drain before use. Add a tablespoon of water to the liner of the Instant Pot and set it to saute. Add the onions, ginger and garlic and saute for a few seconds while you prep the potatoes and spinach. When the onions start to turn translucent, add the vegan yogurt and saute for another minute. Add the tomato puree, turmeric, cayenne and rajma masala or garam masala and give everything a stir. Add the potatoes and spinach along with the drained kidney beans and mix well. Add three cups of water. Turn off the saute function, click in the Instant Pot lid, and set to the "beans" function which should set the curry to pressure cook for 30 minutes. Let the Instant Pot release all pressure or, if you're in a hurry, wait 10 minutes after cooking and release any remaining pressure. Open and add salt to taste and stir well. Garnish the curry with coriander leaves and squeeze in lemon, if you wish.